The 1925 silent classic starring Lon Chaney that's coming to Blu-ray this November has now been fully detailed. He was the “Man of a Thousand Faces.” Generations of filmgoers the world over have been thrilled by his portrayals that showcased – and more often than not, empathized with – the shadows of human nature. And now the makeup artistry of a true cinematic pioneer can be seen in high definition! On November 1st, Image Entertainment releases the Lon Chaney classic 'Phantom of the Opera' for the first time on Blu-ray™! The Blu-ray™ features 3 versions of the film – assembled together for the first time in a single release -- including a brand-new high definition digital transfer from the 35mm negative, plus Gaylord Carter's famous theatre organ score, released for the first time as recorded in stereo! * Standard definition presentation of the original 1925 release from a 16mm tinted source copy. Accompanied by a new piano score by Dr. Frederick Hodges. As in all his films, Chaney designed the now signature makeup for the Phantom, employing techniques – like pining his nose with wires – that not only expressed the outward physical pain of the characters, but inflicted great personal discomfort on the actor bringing them to life. 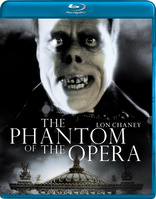 The Phantom of the Opera is an allegory of desire, featuring Chaney’s tour-de-force performance. Love and hate; violence and obsession; shame and honor: all are combined to create one of the greatest characters in cinematic history...and a must-have Blu-ray™! The Blu-ray will feature 1080p video, an uncompressed mono soundtrack, and supplements will include: Phantom of the Opera Trailer, Gabriel Thibaudeau Interview, Photo Gallery, Phantom Script, and Phantom Souvenir Program Reproduction. You can find the latest specs for 'Phantom of the Opera' linked from our Blu-ray Release Schedule, where it's indexed under November 1.